It’s funny getting to 60 and realising you weren’t the kid you thought you were, 50 or more years ago. That you’ve had this picture of what you were like when you were young, which turns out to have been: wishful thinking; mildly delusional; revisionist; or a bit of all of those. Here’s what I thought I was, in those younger years: a clever, if slightly nerdy kid who did well at school, was liked by his teachers, didn’t get into any real trouble, and never gave his parents a worry in the world. Turns out that version wasn’t true. I was in fact inattentive, careless, with my head in the clouds and not fulfilling my potential. If I was getting the reports about my kids that my parents were getting about me, I would have been worried. I have come to that understanding because one of my father’s favourite hobbies was filing. We sometimes thought it more obsession than hobby, but it has turned up some revealing, almost disturbing, material. A decade or more ago, dad proudly presented me with a folder that contained every school report I had ever received, starting in third class (year 3, they call it now). I had never realised he diligently collected them. It appears he never missed filing one report. I hadn’t paid much attention to that file, until I started on another typical turning-60 thing – writing about your life just in case anyone will ever be interested in it some time later this century or next. I did a bit of research and remembered there was some contemporaneous material, the school report folder, and I delved into it to find support for my optimistic self-assessments. 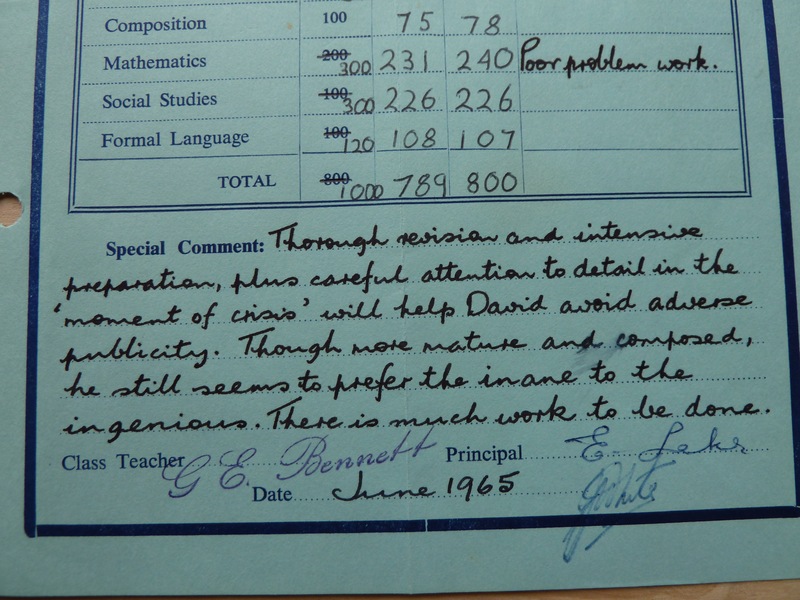 In my half yearly 4th class report, in June 1963, Mr Farrow wrote: “Although David is inattentive at times, his results are quite satisfactory.” Satisfactory? I’d always thought I was kicking arse in 4th class. Yes, very amusing. I can see Mr Bennett congratulating himself, for coming up with such witty repartee. I obviously must having been generating some of that “adverse publicity” – sorry mum, sorry dad. My high school reports were nowhere near as detailed as those early primary school ones. So my optimistic illusions, or delusions, about those years can maybe remain intact. But I I guess I now know how the former Premier felt when that “thank you” note turned up.